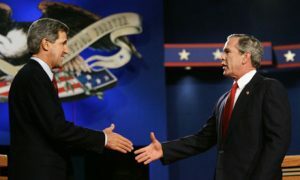 President George W. Bush and Democratic Presidential Nominee John Kerry engaged in three presidential debates in the fall of 2004. The Commission on Presidential Debates, a non-profit and non-partisan organization, sponsored each debate.1 The debates took place at the University of Miami on September 30, Washington University in St. Louis on October 8, and at Arizona State University on October 13. 1 Commission on Presidential Debates, http://debates.org/, (Accessed May 13, 2014). 2C-Span, “Bush-Kerry Presidential Debate, September 30, 2004,” http://www.c-span.org/video/?183580-1/presidential-candidates-debate-full-screen, (Accessed May 13, 2014). 7Cable News Network, “Poll: Kerry tops Bush in debate: But Bush gets nod for believability, toughness,” October 1, 2004, http://www.cnn.com/2004/ALLPOLITICS/10/01/debate.poll/index.html, (Accessed May 13, 2014). 8C-Span, “Second Bush-Kerry Debate, October 8, 2004,” http://www.c-span.org/video/?183582-2/presidential-candidates-debate-full-screen, (Accessed May 13, 2004); Commission on Presidential Debates, “Debate Transcript: Second Bush-Kerry Debate, October 8, 2004,” http://www.debates.org/index.php?page=october-8-2004-debate-transcript, (Accessed May 13, 2004). 10Cable News Network, “Poll: No Clear Winner in Second Debate, October 9, 2004,” http://www.cnn.com/2004/ALLPOLITICS/10/09/debate.main/index.html, (Accessed May 19, 2014). 11C-Span, “Third Bush-Kerry Presidential Debate, October 13, 2004,” http://www.c-span.org/video/?183583-1/presidential-candidates-debate-full-screen, (Accessed May 14, 2014). Commission on Presidential Debates, “Debate Transcript: Third Bush-Kerry Presidential Debate, October 13, 2014,” http://www.debates.org/index.php?page=october-13-2004-debate-transcript, (Accessed May 14, 2014). 14James Rainey and Susannah Rosenblatt, “Kerry’s Reference to Mary Cheney Hits a Nerve,” The Los Angeles Times, October 15, 2014, http://articles.latimes.com/2004/oct/15/nation/na-marycheney15, (Accessed May 19, 2014). 16Cable News Network, “Poll: Early poll gives Kerry the edge in final debate, October 14, 2004,” http://www.cnn.com/2004/ALLPOLITICS/10/14/snap.poll/index.html, (Accessed May 19, 2014). 17Federal Election Commission, “Presidential Results, 2004,” http://www.fec.gov/pubrec/fe2004/federalelections2004.shtml, (Accessed May 19, 2014).